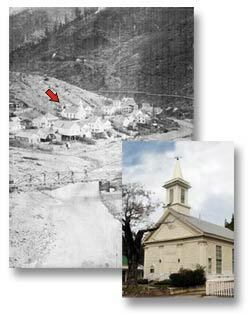 Construction of the Methodist Church of Downieville also began in 1853, the same year as the First Catholic Church. 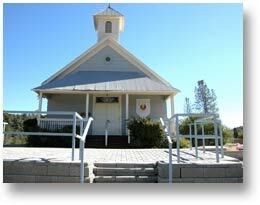 However, the Methodist church, which also served as the area's Episcopal church, was not completed until 1856, This original structure is still in use today and is now California's oldest Protestant church building in continuous use. Prior to the church being constructed, the town's folk were holding Sunday services in other buildings. The construction site of the Methodist Church of Downieville had not been mined, so once construction was complete, the property was mined via tunneling – once using gravel to support the foundation and again using dirt that had to be taken in by wheel barrow. Of all the gold mined from beneath the Methodist church, the congregation never received any of the profits. A new floor was constructed in 1960, at which time a cavity 7 feet in diameter and several feet deep was discovered. No wonder the church's foundation had continued to settle so drastically, causing such continued necessary repairs. 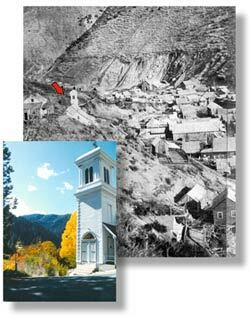 Not even churches were sacred when it came to gold mining in the 1800's. was a simple structure built in 1853 under the direction of Father Shanahan, a priest who had visited the mining camp after a devastating fire in 1852 had burned down most of the communities buildings. The church was active even though it didn’t have a permanent pastor. Father Dalton traveled frequently from Grass Valley to the northern corners of Sierra County, including to Downieville when in 1856 he purchased a former Baptist church for $2,300. 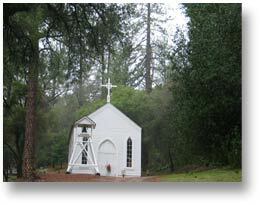 On June 22, 1856, the church was dedicated as “The Assumption.” In the winter of 1856, Father Charles Delahunty became pastor of the Downieville parish. While guarding his own flock, Father Delahunty also traveled to the many other mining towns of Sierra County until 1861, when he was transferred to Virginia City. 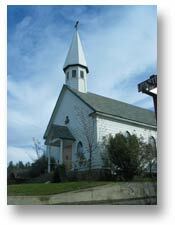 To this day, The Immaculate Conception Church still serves the residents of Downieville. The Ladies of Emmanuel Church will hold a Ladies’ Fair Oct. 5. The attendance of a great number of ladies from adjoining towns is anticipated and gentlemen will do well to make note of the time. 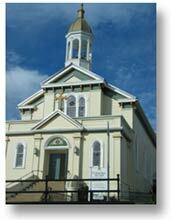 In 1870, the building became the Methodist-Episcopal Church. 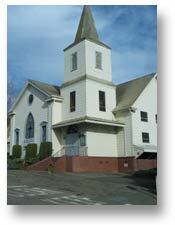 In 1921, the Methodists took ownership of the property and building and that year made extensive improvements. 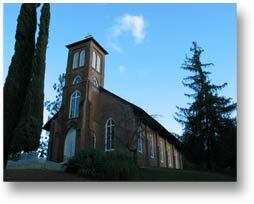 The church was in use as a house of worship until 1963 when it was deeded to the California State Parks division. 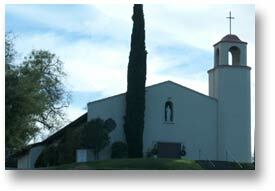 St. John's Catholic Church is not the congregation's original meeting place. A small log church was built in 1856 but as the membership grew the need for a larger building was fulfilled in 1858 with the construction of this standing building. Unfortunately this little church fell into severe disrepair as the fortunes and citizens of Coloma dwindled over the next century. It was successfully rescued in 1972 when it was lovingly restored. The original bell, cast in Sheffield, England in 1860, remains in the bell tower and the original stone foundation was built so tightly that no mortar was needed. It also remains in tact. Inside, some of the fine original pews have been polished to a beautiful luster and the Stations of the Cross are still in place. 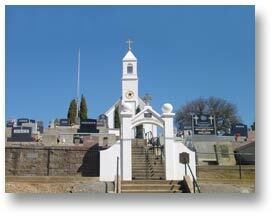 Behind the church is the Catholic Cemetery, which contains 77 graves. The first date of burial is 1850, that of D.A. MacPhee, so the cemetery began before the church building was erected. 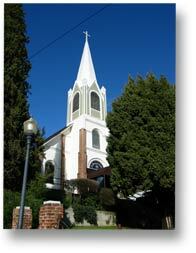 Coloma's St. John's Catholic Church and the Emanuel Church are just a stone’s throw from each other on Church Street. Through the efforts of a young man by the name of Rev. 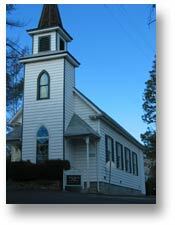 Charles Caleb Pierce, Placerville's Episcopal Church was erected in 1865, four years after the Catholic Church was built. Originally a Quaker, Rev. Pierce was apparently a popular man. There are records of the Pierce Ladies Guild who raised money and received donations in order to build the church that still sits on Coloma Street right near today's Highway 50. In their efforts to collect enough money to finish the church, Pierce received $1,500, which came from four saloonkeepers. The profession of saloon keeping was not held in high esteem, yet after their donations Rev. Pierce had this to say: “There are some excellent and high principled saloonkeepers, as I can attest.” Placerville's Episcopal Church is still in use today. “A substantial frame church was erected on Sacramento Street,” according to an 1852 document that records the first semblance of a Catholic Church in Placerville, then called Dry Diggins. The original name came from the fact that there was not much water with which to mine the gold. After three men were hanged from an oak tree in the middle of town, the community was hung with the unofficial moniker of Hangtown. Lawlessness soon became much less of a problem because of the name. 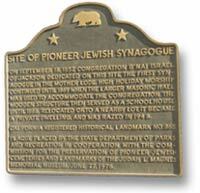 But since the townsfolk were too crazy about their nickname, it officially changed to Placerville in 1854. The new, modern church you see today stands on the same spot as the original but still another building was on that sight in between. The first building was destroyed by fire in 1865. All that was left of it was the beautiful bell, which had been a gift from some miners. It was cast with a considerable amount of silver in it. A new church went up in August 1865. Dry Diggins’ first Catholic priest was a missionary by the name of F. Ingoldsby, who arrived in town in 1852. 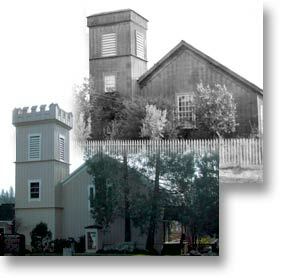 At least two other historic churches, dating from the mid-1800s, graced Placerville but they fell into such severe disrepair, they were eventually demolished in the 20th century. 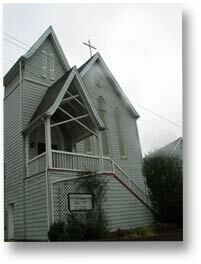 Daniel Harter and his carpenters built this graceful church on Church Street in downtown Jackson in 1868. However, local Catholics had been gathering for mass in various homes since 1852. In 1853, Armstead C. Brown sold them his former residence, which they had been using for church services and it sufficed until 1855 when a new church was built. The 1862 fire consumed that building and in 1868 the current church took its place. A new bell arrived in 1870 but in 1878, it was blown down along with the belfry and cross, which wasn’t replaced until 1894. Part of the accompanying rectory was added next door in 1887; with another half added some time after 1919. St. Patrick’s Catholic Church continues to house its faithful to this day. 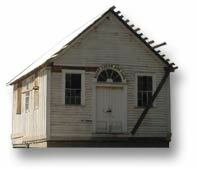 The original Methodist-Episcopal Church was built in 1853, however the same denominations were erected in Fort John, Volcano and Ione prior to Jackson's. The building survived the 1862 fire because it was far enough away from the blaze. In 1968, the wood structure was demolished to make room for the present brick construction. The existing parsonage next door was constructed in 1893. Thanks to a 23-year-old minister, Isaac B. Fish, and his seemingly frail and delicate wife, the Methodist-Episcopal church was finally a reality in Jackson. Fish traveled by foot (he could not afford to own or feed a horse) to Jackson from Mokelumne Hill and surrounding communities beginning in 1851. He preached in homes, frequently to less than a handful of people. During one sermon, a knife fight broke out. Fish declared of Jackson: “The Lord have mercy on the wicked people of Jackson.” But his persistence finally paid off. On a hillside in Jackson, in a neighborhood once known as Newmanville, stands the spectacular St. Sava Serbian Church, built in 1894. Majestic headstones in the cemetery surround the massive snow-colored church. St. Sava (pronounced Saba) was the first Serbian Church built in North America to serve the spiritual needs of the countless Serbian miners who came to the Gold Country to pluck their riches. Prior to the church's construction, the “Slavonian Benevolent Society” was formed in Sutter Creek between 1872 and 1874, depending on which historical account you read. 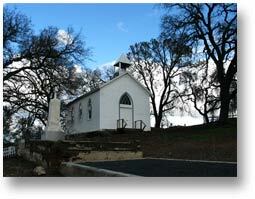 After their Sutter Creek “church meeting place” burned down in 1881, Jackson became their focal point. Construction was completed in December 1894 using brick fired in Jackson. Originally planned as a “Greek Orthodox” church, the Serbian/Slavonian residents were successful in procuring a Serbian charter and thus became the mother church of North America. built and dedicated in 1856. Services have taken place in this church continuously over the last century and a half. began with the transfer of raw land from Charles H. Schroebel and Daniel Pillsbury to three men known only as Dennis, Wyllie and Dunning. The land transfer was recorded on April 6, 1857. Dennis, Wyllie and Dunning paid $250 for the property on which to build the existing church. It is located on, where else but Church Street. Heading north on Hwy 49, turn right at the only flashing yellow light in San Andreas and the church is directly ahead. The intriguing architecture of Angels Camp's Serbian Church is one of the best-restored and most consistently maintained churches in the southern Mother Lode. Sitting on the left side of the road on Highway 49 that runs south directly through Angels Camp, this delightful structure has been photographed more frequently than Elizabeth Taylor. This smaller Serbian congregation was under the guidance of the larger congregation in Jackson. The quaint white church in Murphys’ historic hamlet began with a small group of Protestant's gathering in a home for Sunday services in 1853. There were 10 members to be exact. By 1866, a church that was already built at the present site in 1853, became the permanent home of the First congregational Church of Murphys. 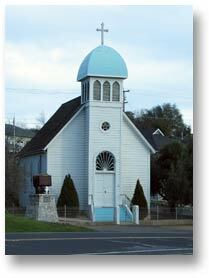 It wasn't until 1885 that the church was legally incorporated. A new church, on the current site, was built in 1895 as the old one was becoming unsafe. The cost of the new building, the one seen today, was $1,622 with much of the labor and materials having been donated. St. Patrick's Catholic Church, located at 116 W. Bradford Street, in Sonora was built in 1875. Another church, constructed in 1863, stood in this same spot. St. Patrick's has been in continuous use since its construction and is still used to this day. 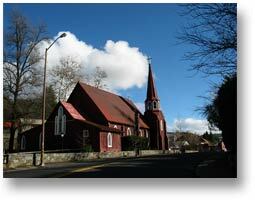 Everyone who lives in the Gold Country refers to Sonora's red church as “The Red Church” for obvious reasons. Constructed of bright red bricks and standing out at a protruding corner downtown, the church is actually St. James Episcopal Church. It was built in 1860. 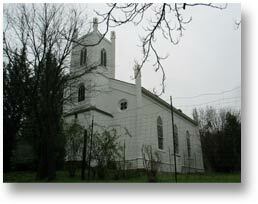 Built in 1855, the St. Francis Xavier Church in Chinese Camp is thought to be the second oldest surviving Roman Catholic Church in the Mother Lod St. Ann's Church in Columbia is the oldest. Although very little remains of the community of Chinese Camp, the wood-frame church, which sits on a dry stone foundation, is in much the same condition as it was 150 years ago. Even a few of the original pews remain inside which are constructed with square nails. The churchyard serves as one of two cemeteries in the area; with the earliest know burial in 1862. Only a few alterations have been made to the building itself beginning in 1948 when the belfry was removed and a new door replaced the old back door, however the original lock and key are still in use. Church services have not been held in St. Francis Xavier since the 1920s, however in 1952 “High Noon” was filmed in Chinese Camp with the church in some of the scenes. The western, considered to be one of the all-time best, starred Thomas Mitchell, Gary Cooper, Harry Morgan, Lloyd Bridges, Grace Kelly and Lon Chaney. has served the folks of the Big Oak Flat and Groveland areas since it was dedicated in 1860. As in most early mining camps, a fire roared through Big Oak Flat in 1863 and destroyed every wooden structure except this little church at the top of the hill. 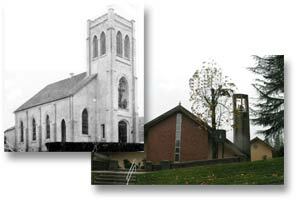 As the population of the area fluctuated several times from the 1860s to today, so did membership at Our Lady of Mt. Carmel. Placer mining gave out in the late 1860 so the population dropped. It grew again in the 1890s with the advent of hard-rock mining. After another drop in residents, more people moved there in 1916 with the construction of the Hetch Hetchy Water & Power Project. Still in use continuously, the church was extensively refurbished in 1977, and 1988 saw the addition of a 16-foot extension. During lean years, mass was held once a month, frequently only if there was a fifth Sunday in the month.